Interior, St. Joseph's R.C. [Roman Catholic] Church, Wakefield, Mass. 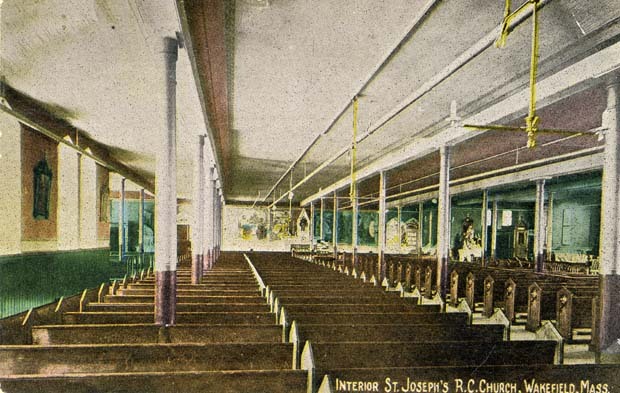 Postcard shows a view of the side aisle of St. Joseph's Church at the corner of Albion and Tuttle Streets. The building was destroyed by fire on March 24, 1977. “Interior, St. Joseph's R.C. [Roman Catholic] Church, Wakefield, Mass.,” NOBLE Digital Heritage, accessed April 25, 2019, https://digitalheritage.noblenet.org/noble/items/show/3748.